Organic Mushrooms grown on our farm. They are dried for easy shipping and storage. Reishi mushrooms are a unique fungus that are not commonly found in traditional recipes. However, this does not mean that they are not a healthy, delicious food. In order to include reishi mushrooms in your diet, consider stewing them for tea, adding them to soup, or grilling them for a tasty side dish that is different from anything else you have ever tried. 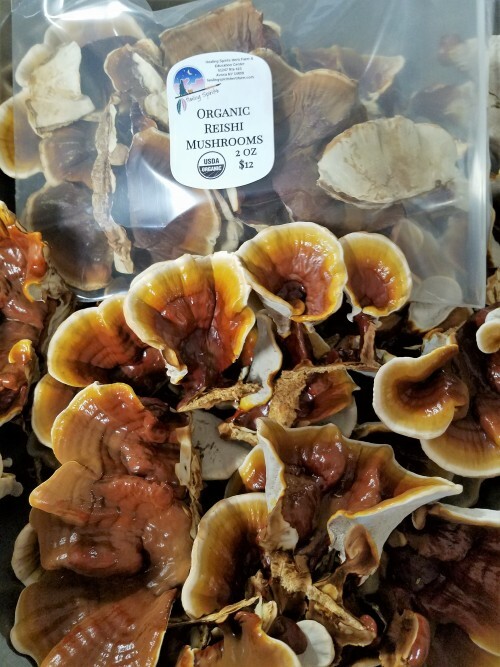 Before learning how to prepare reishi mushrooms, it is important to learn about how the mushrooms grow, and why they are important for good health. Reishi mushrooms typically grow near the base of deciduous trees (especially maple trees), and are relatively rare. Today, reishi mushrooms are grown more commonly in indoor greenhouses, under the covering of wood chips and logs. As stated above, reishi mushrooms have been found to have numerous important health benefits, including aiding in the treatment and prevention of some types of cancers, helping in the management of diabetes and high blood sugar levels, and can even help lower blood pressure readings. One of the most common ways in which reishi mushrooms are prepared is stewed in tea. Reishi tea is made by soaking dried mushrooms for at least eight hours, or overnight. In the morning, carefully remove the reishi mushrooms from the water, and dispose. Strain the water in which the mushrooms have been soaking, and place in a clean pot. Place the pot on the stove over medium to high heat and boil for between five and ten minutes. Allow the tea to cool to a reasonable level, place in a clean cup, and enjoy. While this is the most common way in which to prepare the tea, it can also be made by boiling one cup of water with one teaspoon of dried reishi mushrooms, and some thinly sliced fresh ginger. Follow the cooking methods as described above. Boil the mixture for five to ten minutes, cool, and drink. Another great, healthy way in which to prepare reishi mushrooms is in soup. When preparing the soup, allow the mushrooms to soak overnight. Remove from the water in the morning, and saute in olive oil, salt, and the seasonings of your choice. Add the other ingredients necessary to create the soup of your choice. Serve immediately, or place in an airtight container and freeze for later use. Finally, reishi mushrooms can also be grilled for a tasty side dish. As with the other suggestions regarding the preparation of reishi mushroom, be sure to start this cooking method by soaking the mushrooms overnight. After the mushrooms have soaked, remove from the water, and place on top of a piece of aluminum foil that has been laid flat on a table or counter top. Place a small amount of olive oil, garlic, and other seasonings on top of the mushrooms, and wrap up the aluminum foil, creating a small bundle. Place the bundle on a grill that has been heated to medium-high heat, and cook for five minutes on each side. Cover the mushrooms with water: Cover generously with water and gently push on the mushrooms to submerge them into the water. Soak your mushrooms: Soaking time will vary depending on the size and thickness of the mushrooms. Most thinly sliced mushrooms will be rehydrated in 20 to 30 minutes.